Net Profit Margin is a measure of a company's profitability. It compares the company's Net Income to its Total Revenue. 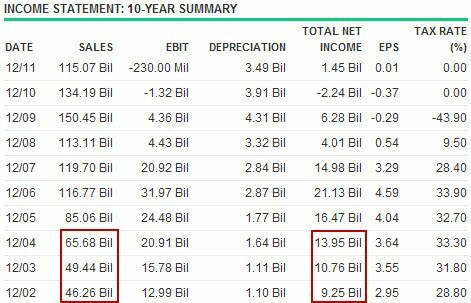 Net Income is the Total Revenue and Gains minus the Expenses and Losses. Total Revenue is the selling price of the company's products times the quantity sold. For companies that are not in the financial industry, the Net Profit Margin must be greater than 20% for companies with a Durable Competitive Advantage or greater than 10% for undiscovered companies. More is better. However, if the company is in the financial industry and this ratio is too high, their risk management department is slacking off. Use a ratio less than 20% as a guide. Anything larger than 20% means the financial company could be taking more risks. Financial companies that are taking on more risk is not a good thing. Companies in the financial industry are banks, investment banking firms, securities firms, brokerage, and mortgage banking firms. In essence, when a bank makes too much money, you should be afraid. Coca-Cola earned $11.809 Billion in Net Income out of $35.119 Billion in Total Revenue for the year 2010. Coca-Cola's Net Income to Total Revenue Ratio is 33.6% which is greater than 20%. They have a great business. IBM earned $15.855 Billion in Net Income out of $106.916 Billion in Total Revenue for the year 2011. IBM's Net Income to Total Revenue Ratio is 14.8% even though it is less than 20%, it is still greater than 10%. IBM is a good company that could potentially be great investment. There are other factors that needs to be verified to see if this company has a Durable Competitive Advantage. Google earned $9.737 Billion out of $37.905 Billion Total Revenue in the year 2011. Google's Net Income to Total Revenue Ratio is 25.6%, which is greater 20%. This is could be an indication of a great company. However, Google does not pay out dividends to their shareholders at this time, so it is least likely that Warren Buffet would purchase shares in this company. Year 2002: Bank of America's Net Profit Margin was below 20%. They had a great business. Year 2003: Bank of America's Net Profit Margin rose above 20%. The company took on more risk. Year 2004: Bank of America's Net Profit Margin was still above 20%. The company continued to take on more risk. During the years 2007 to 2010, at the height of the Financial Crisis, Bank of America's profit plunged because of their risky investments and had to be bailed out by the U.S Government to save it from bankruptcy.